As the country returns to work armed with new diets and promises for what the year 2015 will hold many struggle to get back into the swing of things. Well not our team at Building Additions. We jumped straight back into to work full of new life after recovering from the extensiveness of Christmas and New Year. And what better way to start the new year than with a fantastic installation? Our client specialise in helping scientists meet varying challenges they may face in the laboratory and in the general field every day. Whether routine analysis or new discoveries their innovations aim to help professionals complete science projects the way scientists want to do them. Thermo Scientific (Thermo Fisher Scientific, Inc.) required a movable wall for the option of work space segregation as and when they needed. 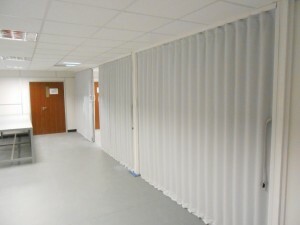 Folding fabric partitions can work exceptionally well in versatile environments just like that of our latest customer. They are ideal for the configuration of a room which needs to be changed often, quickly, and with ease. Many on site installations bring with them challenges of some nature but we always manage to find a solution to the problem. For this installation the problem came with the initial installation. Within this premises there was no direct structure to suspend the partitions to. The solution however was relatively simple and we overcame the challenge by bracing across two conduit struts with timber. 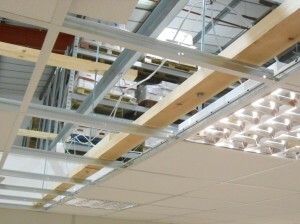 The team then used threaded rod to place another timber just above the ceiling itself. 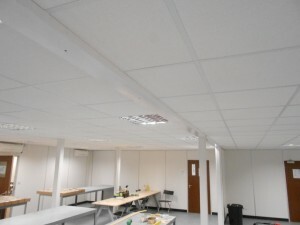 The finished pained head timber was then bolted through the ceiling to the support work allowing us to fit the partition. Sounds complicated does it? It really wasn’t and the initial problem was quickly and efficiently overcome with very minimal stress and absolutely no disruption or delay to our client. 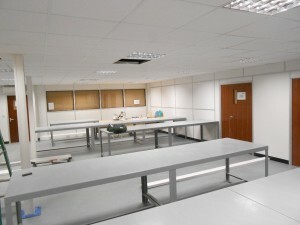 At the end of the day we had one perfectly fitted and fully functioning wall partition ideal for the lab. Not to mention one very satisfied customer. Take a look for yourselves. If you are interested in optimising the space in your working environment, give us a call today on 01373 454 577 or fill out a contact form here.